This article mainly discusses how to put rental DVD to Windows 8.1/8 tablet and smartphones, so that you can watch rental DVDs on portable devices without any time limit. Surface 2, Surface Pro 2, Nokia 2520, Dell XPS 10, Asus VivoTab Smart ME400, Dell Latitude 10, Microsoft Surface RT/Pro, Toshiba Satellite U920T, Acer Iconia W700, Lenovo ThinkPad 2, HP Envy x2, Lenovo Yoga 11S…which one you’ve got as your first Windows tablet? Pavtube DVDAID will detect and list the main title (the full length of this movie with all the chapters) and check it by default. So just keep it untouched and let’s move on to Step 2. You can click the dropdown menu between “Format” and “Settings”, you will see many presets sorted of different device models and programs. Move your cursor over the left column to locate your device model/manufacturer, or you can try the small search box on the bottom right corner. For example, if you own a Surface RT/Pro, just choose “Windows>Microsoft Surface Windows RT/Pro H.264 Video (*.mp4)” as the best profile. Click “Settings” button to configure target file quality. After entering “Profile Settings” panel, you are allowed to adjust video and audio parameters such as bit rate, frame rate, sample rate, etc.. If you prefer a much better video quality and don’t mind the output file size, you can rise the video bit rate higher than 1500. 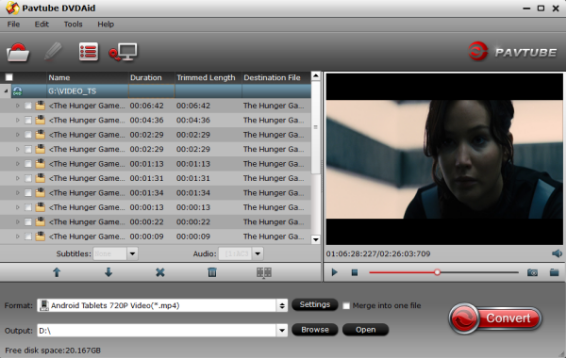 Generally speaking, the higher video bit rate will result in the larger output file size, and vice versa. Now hit the big red “Convert” to start converting rental DVD movies to MP4 with best settings for playback on different Windows 8.1/8 tablets and smartphones. After the conversion, you can get the converted DVD rips in *.mp4 format by clicking the “Open” or “Open output folder” icon.